Brent Allen Zimmerman, age 29 passed away on July 5th, 2018 of a car accident in rural Wolf Point. Brent was born on March 15th, 1989 in Wolf Point to Duane and Colette (Zell) Zimmerman. In the early years, Brent developed the love for baseball, which a ball could be heard bouncing off of the house for hours. Brent also had a love of animal and fish biology. Brent graduated from Wolf Point High School in 2007. He attended College at Minot State University, where he was a member of the Beavers baseball team. Brent was a sportsman, loved to hunt, fish and play baseball. 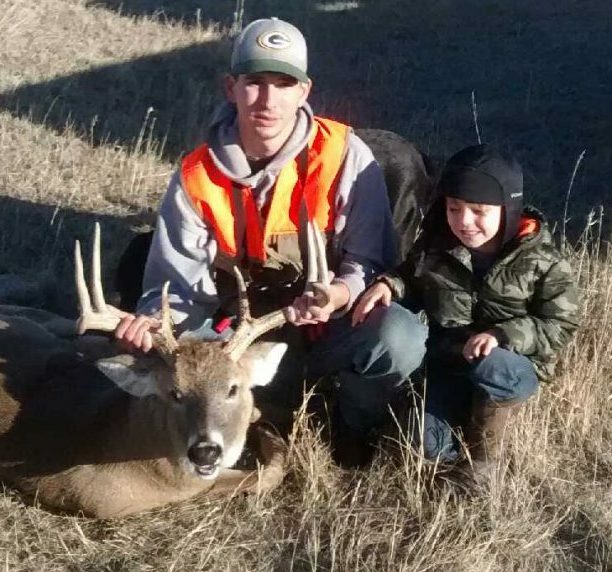 Brent looked forward to the fall when his father, brothers and nephew would get together for the annual bird and deer hunting. This year Brent was able to help his son Hunter learn the sports of soccer and baseball. Brent passed along the love for hunting and fish to Hunter. Hunter and his dog Remi were the joys of Brent’s life. For the past seven-year Brent worked at UPS in the office. Brent was lifelong member of the family farm, working alongside of his dad and brother. Brent is survived by his son Hunter, father Duane Zimmerman of Wolf Point, two brothers, Ryan (Kristina) Zimmerman of Williston, ND, brother Curt Zimmerman of Wolf Point; nephew Peyton of Williston, numerous aunts, uncles and cousins. He was preceded in death by his mother Colette, cousin Jeni Eggebrecht, grandparents Rawlin and Betty Zell of Shelby, Montana, Richard and Violet Zimmerman of Wolf Point. We know Brent is spending his time picking rock alongside his grandpa Richard and fishing by the camp fire with his mother in heaven, we love you Brent. A memorial service will be held at 11:00 a.m. on Wednesday, July 11, 2018 at the First Lutheran Church in Wolf Point, Montana. Inurnment will follow at Greenwood Cemetery. So very sorry for your loss of such a nice young man! Terrible thing to happen! Prayers to the family! I am so sorry for your loss, sending lots of prayers to you, Zimmerman family. Sympathy to Duane and the family. God’s blessings to all of you. Duane, Curt, Ryan, Hunter, Kristina, and Peyton. and to the rest of Brent’s family… so sorry for your loss. Prayers for the family. Duane and family….I am so sorry. Know that my thoughts and prayers are with you. I am so sorry for your loss. I love the part about spending time with Richard. Perfect! Sorry for your lost.. thoughts and prayers..
Duane, I’m so sorry to hear about Brent’s passing and the loss of your son. There are no words that can make it better. Know we are thinking about you and your family during this difficult time. Zimmerman Family, I’m so sorry for your loss. Hugs and prayers for your healing. We are so sorry, our thoughts and prayers are with you all. My heart hurts. He was always so polite. Heaven gained another angel to soon.. So sorry to hear, we are thinking of you all. Oh so sorry for the loss of some one so young. Thoughts and prayers are with you during this very difficult time. Peace be with you all. So sorry, Duane, out thoughts and prayers are with you and your family. Duane, I am so very sorry for your loss, my thoughts & prayers are with you all. My sincere and deepest sympathies go out to Duane and family. Brent was such a nice young man and a wonderful father to Hunter. I’m going to miss meeting him on highway 13 either going to the farm or going home. Rest In Peace dear Brent. We are so sorry for your loss. Our thoughts & prayers are with you. Duane, Ryan, Curt, & Hunter I’m so very sorry hear of Brents passing. My heart is broken for you all and you will be in my thoughts and prayers! I am so sorry, Duane and family for your loss. He was such a sweet boy in first grade! Prayers to the Zimmerman family. I was fortunate to work side by side with Brent at UPS for six years. We developed a close friendship. I’ll treasure that friendship always. Sorry to hear this horrible news. Our thoughts and prayers are with you all..
Duane, I am so sorry to hear about the loss of your son, it has to one of the hardest things in life to endure, my thoughts are with you and your family. Duane, I am so very sorry to hear of the loss of your son. My thoughts and prayers are with you and your family. Duane, I am so sorry for the loss of Brent. It is not easy losing a son at such a young age. May your many memories help to get you through this sad time. I am sure Colette was waiting with open arms just like his Grandpa and Grandma. My thoughts and prayers are with you and your family. Duane, I’m so sorry to hear of your Brent’s death. My thoughts and prayer are for you and your family. So very sorry for your great loss Duane. God bless and comfort you.